That beckon me to the wild northern woods. 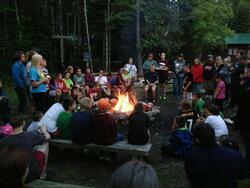 Come join us at Flaming Pine Youth Camp located in the beautiful northern woods on Minnesota. At Flaming Pine Youth Camp our mission is to glorify God in all that we do, whether it be through Bible study, song, crafts, athletic activities, and much more. Did you know that last year 64% of camp operations were possible thanks to donations. ​If you plan to shop Amazon.com, please add FPYC as your Amazon Smile charity so that a portion of your purchase goes towards the continued work at Camp!